Is this summer hot enough for ya yet? Yeah, I know. As far as the calendar goes, it’s still spring. But we’ve already had as many 100 degree days as all of last summer so I think I can safely say it’s summer in central TX. 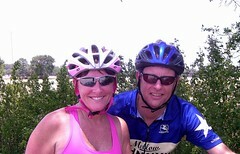 Despite the heat, we’ve managed to get out in the Hill Country and do a couple interesting rides recently. 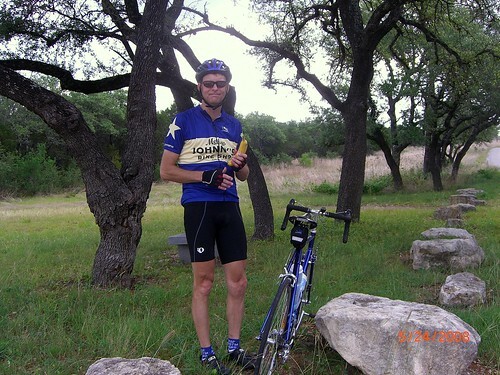 A few weeks ago we did an old favorite – a ride from Dripping Springs to Johnson City. The Creek Road route south of Dripping Springs is always a favorite. Low traffic and scenic countryside. The only downside to this route at all is the relatively short section of Hwy 290 as you go from FM-165 to the park road FM-3232. It’s busy with only a narrow shoulder and that shoulder is about as rough as asphalt gets. FM-3232 is nice though with some fantastic views of the Hill Country. The entrance to the park has a nice spot under some trees to take a break – which we did. FM-2766 into Burnet is a similar scenic road of rolling hills. The windmill pictured here caught my eye on the way out. 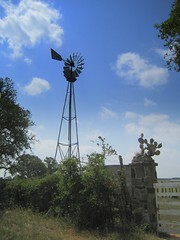 There’s no house or barn there any more but the windmill still works. Some Prickly Pear cactus has somehow managed to take root and do quite well on the top of a rock gate post. The same road has a winery named Texas Hills. We didn’t stop in but oddly enough, there was a wine festival in Austin the very next day and we went to it. Texas Hills was there. Surprisingly, one of Texas Hills wines turned out to be one of our favorites of the day. Their Due Bianco is a blend of Pinot Grigio (21%) and Chardonnay (79%) and it was crisp and fruity and perfect for a hot day. The middle picture of Kem and I was taken on Creek Rd on the return. If we look a little red, well, it’s cause we were hot! 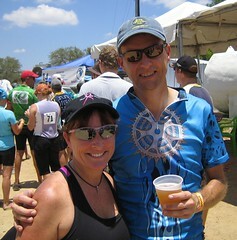 The other ride we did was the Real Ale ride in Blanco. It was a benefit ride done by Real Ale for the public library there. They had a huge turn out. By their report 1400 riders. Logistics were a bit of a mess at the start, but otherwise, the ride was great. The 50 mile route was pretty hilly and the heat pretty intense. As the morning wore on it appeared to take its toll. I think the medics were busy that day. We took it slow and were fine. The bottom picture here was post ride at the Real Ale brewery. There were serving up mounds of BBQ and some of the beer they make on site. The Firemans #4 Blonde Ale which we’re raising a glass of here was perfect for post ride quaffing. More please. Great pics. We missed you guys on TOMRV this weekend. You would have enjoyed the humidity. It is the first time I have had a huge cramp in my quad. Going up the last hills. I like the windmill picture. There are several of those around Texas. Whenever I see one by itself I wonder about all of the history that must have taken place. The heat and dry wind in Houston has been very unusual. Just tonight I was enjoying the low humidity as I rode.